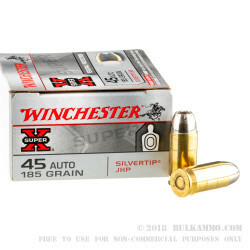 Meet the new .45 ACP Winchester Silvertip Jacketed Hollow Point cartridge. 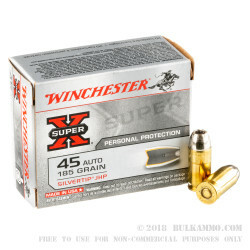 Oddly, it’s the same as the old .45ACP Winchester Silvertip Jacketed Hollow Point cartridge. For decades it’s been a performance ammunition worthy of the most discerning tactician’s praise. It proves that ammunition engineering has come a long way since lead castings, but maybe it’s not so much about innovations that change the landscape anymore, and instead it’s about optimizing time tested and proven designs like the venerable Winchester Silvertip. Hardly having changed in many decades this 185 grain load offers 1000 feet per second velocity and 410 ft. lbs. of energy at the muzzle in a threat stopping, high retained weight jacketed hollow point design that everybody has heard of. The unique finish on the JHP projectile gave it the name but the lasting legacy of the round came from uncompromising quality control, great engineering and high quality manufacturing processes. 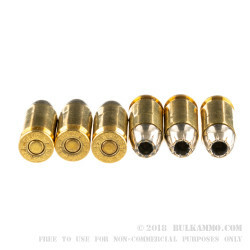 The reloadable brass cartridge casings and the Boxer primer make these personal defense rounds easily reloadable adding value to the whole proposition. The powerful mix of speed, bullet weight, wound channel size and reliability makes this load something quite special, and worthy of the longevity it has achieved. These are suitable for use in any .45 ACP firearm. You can not go wrong shopping here, whether your aiming at targets, those no legs, 4 legs or protecting your family an home from those infamous 2 legged animals that survive by stealing from good people. 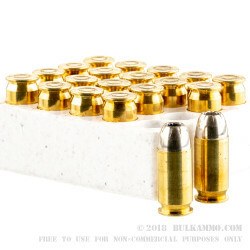 BulkAmmo.com has every round you'll ever need for almost ever caliber.